This is “Introducing the Realm”, section 8.1 from the book Regional Geography of the World: Globalization, People, and Places (v. 1.0). For details on it (including licensing), click here. Understand three basic traits the countries of the realm shares in common. Outline the two cultural hearths and explain why they developed where they did. Describe how the people of this realm gain access to fresh water. Understand how the events of the 2011 Arab Spring have affected the realm. The countries of the realm share three key dominant traits that influence all other human activities. The first key common trait relates to the climate of the region. 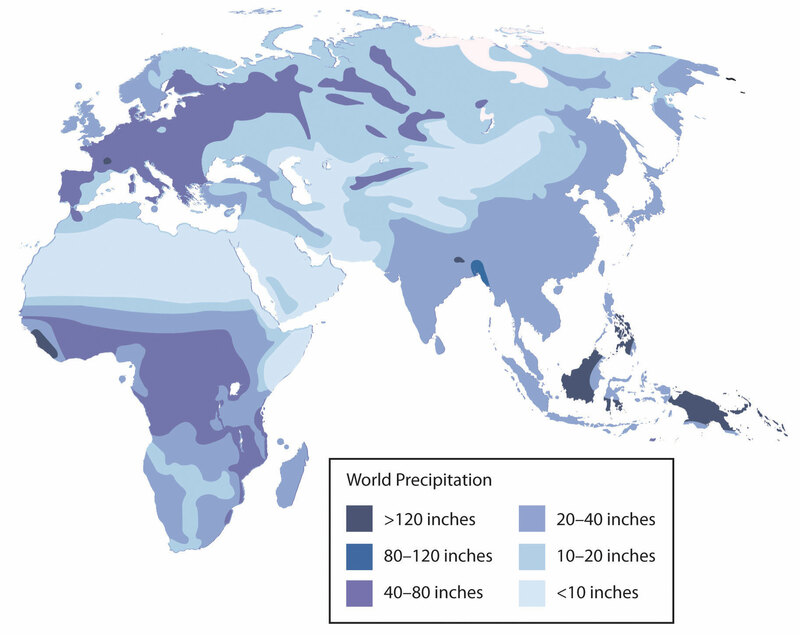 Though various climate types can be found in this realm, it is the dry or arid type B climate that dominates and covers most of the physical area. Other climate types include the type H highland climate (cold temperatures at the high elevations with moderate temperatures at the bases) of the mountains of the Maghreb, Iran, or Central Asia and the more moderate type C climate in the coastal regions bordering the sea. The type C climate along the coastal Mediterranean area attracts human development and is home to many large port cities. The overall fact is that vast areas of each region are uninhabited desert. North Africa has the largest desert in the world—the Sahara—which borders the Libyan Desert and the Nubian Desert. About one third of the Arabian Peninsula is part of the Empty Quarter of the Rub’ al Khali (Arabian Desert). Kazakhstan, Uzbekistan, and Turkmenistan have vast regions of desert with few if any inhabitants. This aspect of the realm reveals the importance of water as a valuable natural resource. Most people in the realm are more dependent on the availability of water than on the availability of oil. The second trait is Islam: most of the people in the realm are Muslims. The practice of Islam in day-to-day life takes different forms in the various divisions of the religion. The differences between the divisions have contributed to conflict or open warfare. Islam acts as more than just a religion. It also serves as a strong cultural force that has historically unified or divided people. The divisive nature of the religion has often resulted in serious political confrontations within the realm between groups of different Islamic ideologies. Concurrently, the religion of Islam is also a unifying force that brings Muslims with similar beliefs together with common bonds. Islam provides structure and consistency in daily life. The faith can provide comfort and a way of living. The holy cities of Mecca and Medina are located in Saudi Arabia. Other holy cities for other divisions of Islam include Jerusalem and the two cities holy to Shia Muslims: Karbala and Najaf in Iraq. Islam dominates the realm, but other religions are significant in various regions. Israel is a Jewish state, and Christianity is common in places from Lebanon to Egypt. There are also followers of the Baha’i faith, Zoroastrianism, and groups such as the Druze, just to name a few. The third factor that all three regions of the realm share is the availability of significant natural resources. North Africa, Southwest Asia, and Turkestan all have significant reserves of oil, natural gas, and important minerals. It stands to reason that not every country has the same reserves and that some of the countries have very few or none at all. However, in terms of how the countries gain national wealth, it is the export of oil that has dominated the economic activity as it relates to the global community. This realm is a peripheral realm. The resource that the realm can offer to the core economic regions of the world is the energy to fuel their economies and maintain their high standard of living. Enormous economic profits from the sale of these resources have traditionally been held in the hands of the elite ruling leader or his clan and do not always filter down to most of the population. The control of and profits from natural resources have become the primary objectives of the countries; this fuels conflicts and armed military interventions in areas such as Iraq and Afghanistan. Availability and control of fresh water have typically resulted in the ability of humans to grow food crops and expand their cultural activities. Hunter-gatherer groups did not settle down in one area but were more nomadic because of their seasonal search for food. As humans developed the ability to grow crops and provide enough food in one place, they no longer needed to move. The earliest human settlements sprang up in what is the present-day Middle East. Early human settlements provide some indication of early urbanization patterns based on the availability or surplus of food. The shift to permanent settlements included the domestication of livestock and the production of grain crops. Fruits and vegetables were grown and harvested domestically. The activities of this era created humanity’s earliest version of the rural-to-urban shift associated with the Industrial Revolution or present development. It is theorized that the ability to grow excess food provided the time and resources for urbanization and the establishment of organized communities, which often progressed into political entities or regional empires. It has been estimated that some of the earliest cities in the world—Jericho, for example—were first inhabited around 10,000 BCE in the Middle East. In the same region, two cultural hearthsRegion or area where an early human civilization began. provide significant historical value to the concept of human development: MesopotamiaThe “land between rivers,” referring to the land between the Tigris and Euphrates Rivers. and the Nile Valley in Egypt. Both areas were settings for the growth of human civilization and are still being examined and studied today. In Mesopotamia, a remarkable human civilization emerged along the banks of the Tigris and Euphrates Rivers in what is present-day Iraq, Syria, and southern Turkey. The climate, soils, and availability of fresh water provided the ingredients for the growth of a human civilization that is held in high esteem because of its significant contributions to our human history. 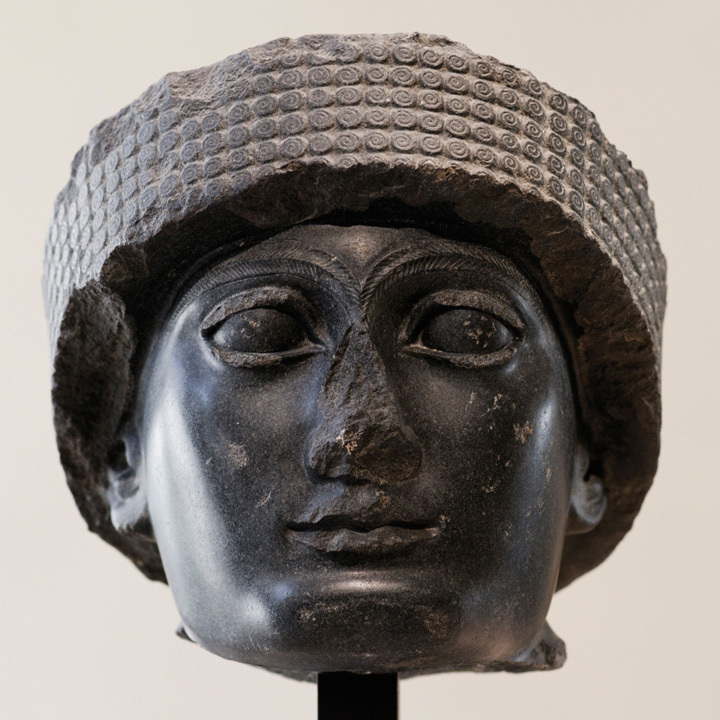 Source: Photo courtesy of Marie-Lan Nguyen, http://en.wikipedia.org/wiki/File:Head_Gudea_Louvre_AO13.jpg. Mesopotamia, meaning “land between rivers,” is located between the Tigris and Euphrates Rivers. Neolithic pottery found there has been dated to before 7000 BCE. Humans in this area urbanized as early as 5000 BCE. People were settling in the Mesopotamia region, building magnificent cities, and developing their sense of human culture. Mesopotamia gave rise to a historical cradle of civilizationThe location where early human settlements developed into long-term cultures with prominent advancements. that included the Assyrian, Babylonian, Sumerian, and Akkadian Empires, all established during the Bronze Age (about 3000 BCE or later). Famous cities such as Ur, Babylon, and Nineveh were located in the Mesopotamia region. The control of water and the ability to grow excess food contributed to their success. They developed extensive irrigation systems. Large grain storage units were necessary to provide the civic structure and to develop a military to protect and serve the city or empire. 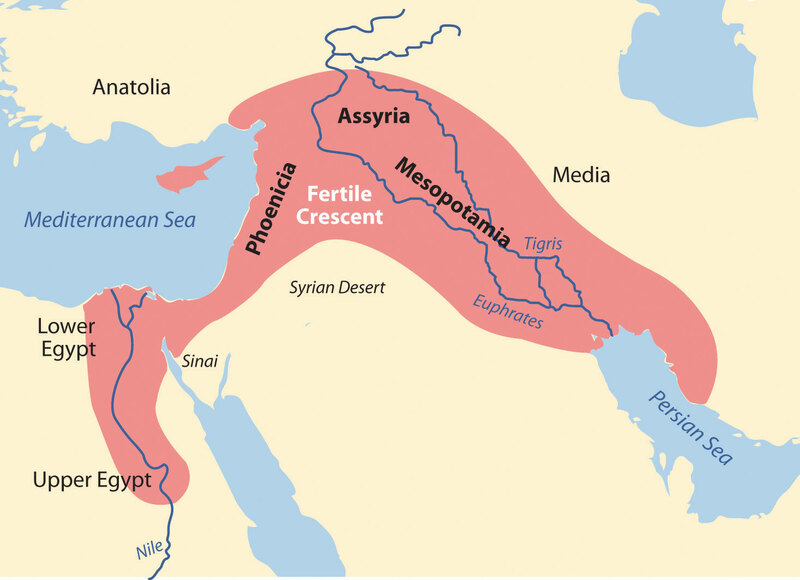 The human activity in this area extended around the region all the way to the Mediterranean Sea, which is where the term Fertile CrescentThe region of Mesopotamia and the Levant where early human civilization flourished. comes from. Various ancient groups were well established on the eastern side of the Fertile Crescent along the Mediterranean coast. The cities of Tyre and Sidon were ports and access points for trade and commerce for groups like the Phoenicians who traded throughout the Mediterranean. Ancient cities such as Damascus and Jericho became established in the same region and were good examples of early human urbanization during the Bronze Age. These cities are two of the oldest continually inhabited cities in the world. 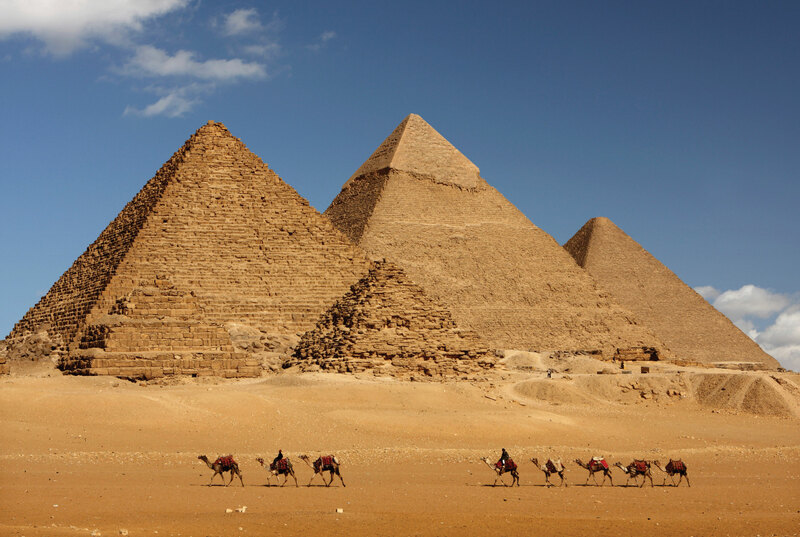 Human civilization also emerged along the Nile River valley of what is now Egypt. The pyramids and the Sphinx in the Giza Plateau just outside Cairo stand testimony to the human endeavors that took place here. Spring flooding of the Nile River brought nutrients and water to the land along the Nile Valley. The land could produce excess food, which subsequently led to the ability to support a structured, urbanized civilization. The Nile River is the lifeblood of the region. In the fifth century BCE, the ancient Greek historian Herodotus suggested that Egypt was “the gift of the Nile.” The dating for the beginning of the civilization along the Nile River is often in question, but Egyptologists estimate the first dynasty ruled both Upper and Lower Egypt around 3100 BCE. Upper Egypt is in the south and Lower Egypt is in the north because the Nile River flows north. The terms “Upper” and “Lower” refer to elevation. Geologists, using the erosion patterns of the Sphinx, estimate that it was constructed about 10,000 BCE. The ability of humans to harness the potential of the environment set the stage for technological advancements that continue to this day. The Egyptian civilization flourished for thousands of years and spawned a legacy that influenced their neighbors in the region, who benefited from their advancements. The human activities that created the civilizations in Mesopotamia and along Egypt’s Nile River gave humanity a rich heritage to help us understand our history. Many of our legends, stories, and myths have their origins in these cultures. Their cultural developments provided the basis for much of the Western world’s religious beliefs and early philosophical ideas. The engineering feats needed to create the magnificent temples and pyramids have by themselves been studied and analyzed over the centuries to give modern scientists and scholars a reason to pause and recognize the high level of organization and structure that must have gone into developing and managing these civilizations. Various aspects of science and the arts were being developed by these ancient people. Writing, mathematics, engineering, and astronomy were becoming highly advanced. Artifacts such as clay tablets and hieroglyphs are still being discovered and interpreted and shed additional light on the advancements of these civilizations and their contribution to our collective human civilization. Water is one of the necessities for human existence, and human settlements have long been based on the availability of water for human consumption and agriculture, navigation, and the production of energy. In North Africa and Southwest Asia, the availability of water has an even greater relevance because of the dominant type B climate. Methods used to address the shortage of water or to access fresh water have been nearly as diverse as the people who live here. Large populations of people can be found wherever there is fresh water. Water has historically been transferred from source to destination through canals, aqueducts, or special channels. Many ruins of extensive aqueducts from Roman times and earlier remain throughout the realm. The issues associated with water use continue to affect the lives of the people of this realm. Rapid population growth and industrialization have intensified the demand for fresh water. Water can be found in the desert regions in a range of forms. For example, there are oases, springs, or noted wells from which people can draw underground water that is close to the surface. Mountainous regions such as the Atlas Mountains in North Africa or the Elburz Mountains in Iran trap moisture, which produces higher quantities of precipitation. The precipitation is then available in the valleys to irrigate crops. Discovering or developing other methods of acquiring fresh water is a requirement in areas without mountains. In the Sahara region, Libya draws water from deep underground wells that tap into the vast aquifers beneath the desert that were charged with water when the region was tropical thousands of years ago. The water is referred to as fossil water. Extensive systems of canals and pipelines have been developed in Libya to extract fossil water and use it for agricultural production or for urban purposes. The man-made river project, one of the largest of its kind, has drawn fresh water from the desert to large cities such Tripoli and Benghazi. The local drinking water in Benghazi is contaminated by saltwater intrusion from the Mediterranean. Underground aquifers are underneath political boundaries, so the allocation and control of water are matters of political debate with the potential to lead to military conflict. The project’s potential duration will be a function of how quickly the water is used and how many people use the aquifer system. The main problem with this system is that underground aquifers are not considered a renewable resource; as more countries tap into the aquifers, the available water will be depleted more quickly. As water is drawn from the aquifers for industrial irrigation, the water table goes down. Local settlements that rely on well water may in time have to dig deeper wells or move to locations where water resources are still available. The major source of water in the Fertile Crescent region comes from the Tigris and Euphrates rivers. Both have their origins in Turkey and converge at the Shatt al-Arab waterway that flows into the Persian Gulf. The Euphrates is the longest river in Southwest Asia and flows through Syria from Turkey before entering into Iraq. Turkey had developed large dams on both the Tigris and Euphrates for agricultural purposes and to generate hydroelectric power. As water is diverted for agriculture in Turkey there is less water flowing downstream for Syria or Iraq. Disputes over water resources continue to be a major concern in the Tigris-Euphrates Basin. The Atatürk Dam in Turkey is largest dam on the Euphrates, and it has a reservoir behind the dam that is large enough to hold the total annual discharge of the river. All three countries have dams on the Euphrates and both Turkey and Iraq have dams on the Tigris. The three countries signed a memorandum of understanding in 2009 to strengthen cooperation within the Tigris-Euphrates Basin. All three countries need the water for agriculture to produce food for a growing population. Agreements to share water have been difficult as a result of the Iraq War and the recent protests and demonstrations in Syria that have contributed to further political tension between the three countries. Israel has taken innovative steps to conserve water and use it efficiently. Drip irrigation mixed with fertilizers is called fertigationSystem of drip irrigation mixed with fertilizers used in Israel.. Fertigation is used extensively in the area. Israel grows plantation crops such as bananas, which require large quantities of water. Banana groves are covered with material that allows sunlight to penetrate but reduces the amount of transpiration, which conserves water. Israel has worked to recycle water whenever possible. Gray water is water extracted from sewage that has been treated to be used in agriculture. Underground wells in the West Bank region provide water for a high percentage of people in both the Palestinian areas and Israel. The issue of control over the water is contentious at times. Just as the control of water may have been an important factor in the early Mesopotamian civilizations, it remains a point of political conflict in places such as Israel and the West Bank. The lack of fresh water and the heavier demand placed on water resources have caused countries that can afford it to desalinize seawater. This process is used extensively in the oil-rich states of the Arabian Peninsula. Israel is implementing a similar plan to accommodate their increasing population and fresh water requirements. The grove is covered with material that allows sunlight to penetrate but helps reduce the loss of water through transpiration. Iran is largely a desert climate; thus most of the country does not receive copious amounts of precipitation. In an effort to redistribute the water available from the high mountains, Iranians have developed a system of qanatsSystem of shafts or wells along a mountain slope that allows water to collect into a common underground channel, which is then diverted to wherever it is needed. to collect water where it is available and channel it to the cities or urban areas for use. A qanat might include a system of shafts or wells along a mountain slope that allows water to collect into a common underground channel, which is then diverted to wherever it is needed. This system has been in use since ancient times in many arid regions of the realm and around the world. More than 2,700 years ago, a qanat was developed in what is present-day Iran. The qanat has a system of hundreds of wells and channels water for more than twenty-eight miles; it still provides drinking water to more than forty thousand people in the city of Gonabad. Thousands of qanats were developed over the centuries in this area. Persians used cold qanat water from the mountains to keep ice cool during the summer months. Agricultural production relies heavily on water from qanats, which in turn are dependent on climate conditions and local weather patterns. The Arabian Peninsula almost always conjures up images of desert conditions; contrary to that image, there is water in the peninsula. Underground aquifers of fossil water are located beneath the sands similar to that in the Sahara Desert. Saudi Arabia taps into these water resources to irrigate agricultural land to grow food. This area faces the same issue as Libya and other areas of the world that rely on underground aquifers: eventually the water supply will be used up. The majority of the Arabian Peninsula is desert and water is always in short supply. Many coastal desert countries such as the United Arab Emirates (UAE), Bahrain, and Qatar have resorted to the desalinization of seawater for their needs, but this is viable only as long as the country can afford the energy cost required to operate the desalinization plants. Yemen is a state on the Arabian Peninsula that is mountainous and has used terracing to more effectively benefit from what little precipitation they receive. Water from precipitation is trapped in terraces, and as it flows down the mountainside, each terrace uses what it needs and then passes the water to the next lower terrace. More land can be farmed to produce higher yields of agricultural crops such as sorghum and cereals. One of the main problems with Yemen’s terrace system is that most of its trees are being cut down for firewood. Tree roots are essential for holding the soil together on the fragile mountain slopes. Another problem is heavy rains that cause serious erosion and damage to the terrace system. Additionally, the extremely rapid growth rate of Yemen’s population is outstripping its agricultural production. Fresh water is in short supply in many of the desert regions of Turkestan in Central Asia. Agricultural production has traditionally been dependent on water flowing in rivers and streams that originated with the precipitation from the mountains, but as humans have developed canals and irrigation systems, water from rivers has been diverted for agricultural use. Vast fields of cash crops such as cotton were developed during the Soviet era for economic reasons, and as discussed in more detail in Section 8.7 "Central Asia and Afghanistan", the result had devastating consequences for the Aral Sea, which depended on the water from these rivers for its survival. More than half the population of Central Asia depends on agriculture for their livelihood. The other half, of course, requires water and food for their existence. The year 2011 brought about important changes for the human geography of parts of this realm. The year ushered in a wave of human activity that awakened the power of the citizens to speak out against conditions in their country and actively protest against their governments. North Africa, the Middle East, and the Arabian Peninsula experienced the highest levels of protests and insurgency. Political leaders that had been in power for extended periods were challenged and removed from office. Democratic reforms were requested or demanded by citizens seeking more individual freedom and greater access to political power. Uprisings in some of the countries were internal; other countries received external support or intervention. Overall, demonstrations, protests, and outright revolution involved millions of people desiring improved living conditions and a better future for themselves and their families. Protests emerged in North Africa in the beginning of 2011. Tunisia was the first country in which leadership felt the heat of civil resistance and open revolution. In January, the Tunisian president of more than twenty-three years was forced to flee to Saudi Arabia. In Egypt, millions of protesters demonstrated in the streets against political corruption and the lack of reforms. The revolution of Egypt’s citizens was not an armed conflict, but it was an effective protest, because it eventually brought about the ouster of President Hosni Mubarak, who had been in office for almost thirty years. Demonstrations and protests continued against governments in Morocco and Algeria; the people voiced their concerns regarding issues such as high unemployment, poor living conditions, and government corruption. Libya’s protests erupted into a full-scale armed revolution as antigovernment rebels took control of the city of Benghazi in an attempt to topple Muammar Gadhafi’s forty-two years of authoritarian control of the government, oil revenues, and the people. The armed Libyan revolution was eventually successful in taking control of Tripoli and in removing Gadhafi and his family from power. The revolution in Libya was aided by North Atlantic Treaty Organization (NATO) air strikes and the implementation of a no-fly zone over the country. The ripple effect that the Tunisian revolution had on North Africa was felt on the Arabian Peninsula in places such as Yemen and Bahrain. Mass public demonstrations in Yemen over government corruption, economic conditions, and high unemployment escalated into serious armed conflicts between government troops and opposition factions that wanted the president removed from office. In Bahrain, the protests and demonstrations were centered on the request for more personal freedoms and a greater role in leadership for the Shia population, who experienced discrimination by the Sunni-dominated government. Protests also occurred in Oman for greater reforms. The Middle East did not escape the Arab Spring of 2011. Protests in Jordan forced King ‘Abdullah II to reorganize his government. Israel and Lebanon were not as affected, as they have been addressing many of these issues on an ongoing basis. The country experiencing the greatest impact was Syria. Major mass demonstrations and serious protests against the government were staged in a number of cities across the country. In Syria, the long-term leadership of an Alawite minority continues to run the government and control the military. The al-Assad family—a father and then his son—has ruled Syria since 1971. The Syrian government has cracked down on the revolution with hard-line measures aimed at subduing the protests and demonstrations. By September 2011, more than two thousand protesters had been killed in Syria, and many more were detained or tortured. Countless others have tried to flee to neighboring countries for their safety. The protesters in Syria want democratic reforms as well as the end of the al-Assad family reign. Other parts of the realm also felt the effects of the Arab Spring of 2011 with mixed results. Iran has had similar protests and demonstrations in past years, but there was not a major revolution or uprising as a direct result of the Arab Spring. Iran is not an Arab country but has experienced ongoing political friction between citizen factions and the government. The wars in Iraq and Afghanistan have tempered or isolated internal protests or revolutionary activities in those countries even though armed conflicts continue. Various Central Asian states have been working through similar issues but either have not had mass demonstrations or have not received the attention of news media regarding their situations. The wave of change that swept over the realm in the Arab Spring of 2011 is an example of how centripetal and centrifugal cultural forces act on a state or region. The political landscape was altered or drastically changed in many countries. The impact of these changes will be realized in the years and decades to come. The realm of North Africa and Southwest Asia extends from the Atlantic Ocean along the Moroccan coast to the western border of China. It includes the regions of North Africa, Southwest Asia, and Central Asia (often referred to as Turkestan). Three basic features that dominate this realm include the arid type B climates, Islam as the predominant religion, and the export of petroleum and minerals to gain wealth. There are exceptions to all three features, but these three are found within most countries of the realm. The two main cultural hearths in this realm are located along the rivers in Mesopotamia and in Egypt. Control of and access to water resources to grow excess food were the basis for the success of the empires that flourished in these two areas. Fresh water is a valuable resource that is not always available in North Africa and Southwest Asia because of the climate and physical geography. Each region within the realm has developed its own methods to draw from or extract the valuable resource of fresh water. The Arab Spring of 2011 was a massive wave of protests and demonstrations by citizens of the realm against their governments over such issues as poor living conditions, high unemployment, government corruption, and the lack of democratic reforms. Various leaders were removed from office and governments were pressed to reform their power structures to allow for more shared governance and reduced political corruption. Why does this realm include parts of three continents? Which countries have territory on more than one continent? What common traits are shared by most people in this realm? What might have prompted the first rural-to-urban shift for human settlements? Why is the Middle East called by that term? What is it in the “middle” of? What did the two cultural hearths contribute to the advancement of human culture? Why did the cultural hearths develop where they did? What are some of the methods Israel has used to address their fresh water requirements? What prompted the Arab Spring of 2011? Which country was the first to see change? What were some of the common issues that people protested across the realm?